Dubai, July 29, 2015: Introducing Stokke® Home, a modular nursery line designed to grow with your baby and adapt to your needs from birth well into childhood, exclusively available at JustKidding stores in Dubai, KSA and online at www.justkidding-me.com. Preparing for your baby's arrival while designing your dream nursery is an exciting time, and whether you´ve got lots of space or little to spare, Stokke Home will be a special place as all true homes are. 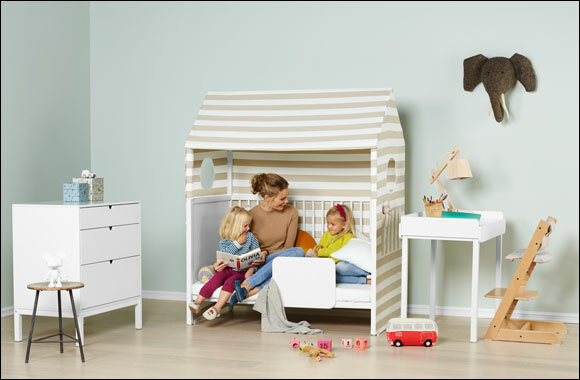 With Stokke® Home, you can create the perfect room to spend time cuddling with your newborn and later for imaginative play with your toddler. Combining superior craftsmanship and the best of Scandinavian design, the flexibility of Stokke® Home lets you select and combine pieces that work in your interior, large or small, sweet or sophisticated. Every piece in the collection offers quality, function and beauty at its best. Available in warm Hazy Grey and White with coordinating accessories to add your individual touch. The soft, light textiles of the cradle give your baby plenty of airflow and a cosy environment to rest, sleep and dream. At night-time, keep your baby close by your bed – the cradle´s small footprint allows you to fit it into any size bedroom. The cradle´s light weight makes it ideal for daybed usage - just move it from one room to another. The bed is the heart of the Stokke® Home™ nursery. Together with the cradle, the changer and the dresser, it offers countless possibilities for designing the perfect room for your newborn. The distinct house shape turns this bed into the centerpiece of the nursery. We offer a range of textiles designed to create a calm ambience for your baby, or a playhouse for your child. Not only is the concept ideal for your newborn as well as your growing child but it is also flexible enough to be customized no matter the size of your nursery. The changer is a versatile component that can be used on top of the dresser, the bed or the cradle stand, and attaches safely to all components. Protective sides and a padded changing mattress offer a safe and comfortable place to change your baby. The included storage box keeps essentials close at hand. When your child is older, the changer transforms into a play table by placing it on the cradle stand. The dresser is the perfect height for changing your baby when the changer is attached. The spacious, soft closing drawers offer plenty of room and give easy access without letting your baby out of sight. Open space for your feet under the dresser lets you get closer when changing and cuddling your baby. The Scandinavian design, together with the durable material, make it a classic piece of furniture that will last for years. Founded in Ålesund Norway in 1932, Stokke began life as a manufacturer of high quality furniture. The first product for children was launched in 1972 – the iconic Tripp Trapp® chair, which has sold more than 9 million units and remains a core product in the Stokke collection. Since 2006 Stokke has focused exclusively on designing premium children´s furniture and equipment within the highchair, stroller, baby carrier, home textiles and nursery segments. Our products promote bonding between parent and child, and ensure healthy development for young children. Owned and operated by three generations of the Stokke family until 2014, Stokke was acquired by Belgium based NXMH, wholly owned by NXC in South Korea. Stokke has worldwide distribution in over 80 countries, as well as its own subsidiaries in Europe, the United States and Asia. Is a trademark of Dubai-based JustKidding General Trading (LLC). Fresh, unusual and captivating, Award-winning JustKidding is an exciting retail store concept for modern, predominantly first-time parents. It introduces a comprehensive range of internationally acclaimed, high quality, high-end products for newborns, young children and pregnant mothers. The products range from furniture and interior design elements to tech smart, stylish strollers and ultra safe car seats and from hip fashion labels to the ultimate in baby care. JustKidding is supported by a team of skilled sales consultants and expert parents. All colleagues have detailed product and practical knowledge. JustKidding prides itself in being the parenting expert in its community.